The final, Amherst, version [of the Showing of Love] notes that painted wooden crucifixes are to be worshiped, speaks emphatically of the Pater Noster, Ave, and Credo, and removes from itself swathes and swathes of translations into English from the [Hebrew] Bible. The great sadness is that Adam Easton had translated the Bible from Hebrew into Latin, correcting Jerome’s errors; this his Bible was stolen from him. He had criticized Wyclif for being unscholarly and for translating Jerome’s Latin errors into English rather than going directly to the Hebrew. 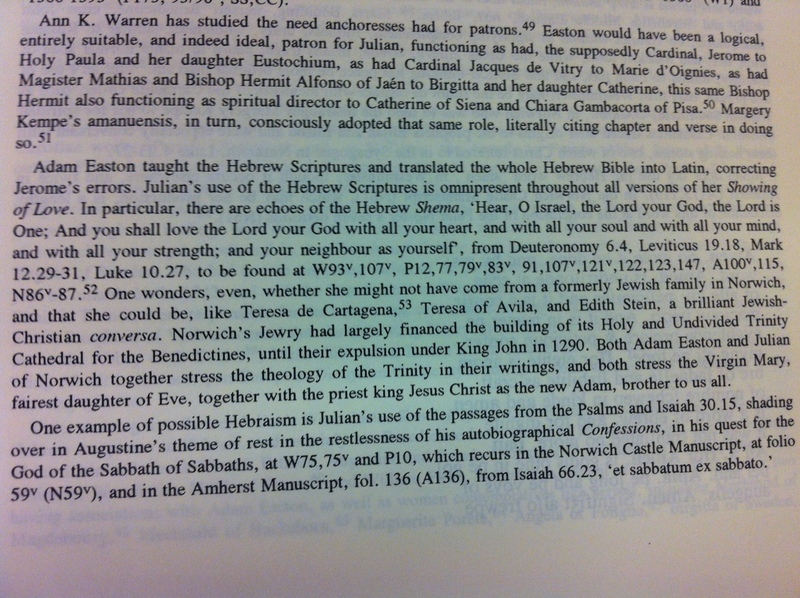 Julian too is translating from the Hebrew, not into Latin but into English, centuries before the King James Bible. Her Showings‘s “All shall be well,” said to her by Christ, translates the Hebrew shalom. The Vulgate and the Wyclif Bibles give this merely as recte and “right.” Julian and the Anglican King James Bible translators got it right. So Julian’s originals with translating she later revised into manuscripts without any translation from the Hebrew Bible, for various reasons, as Holloway observes. 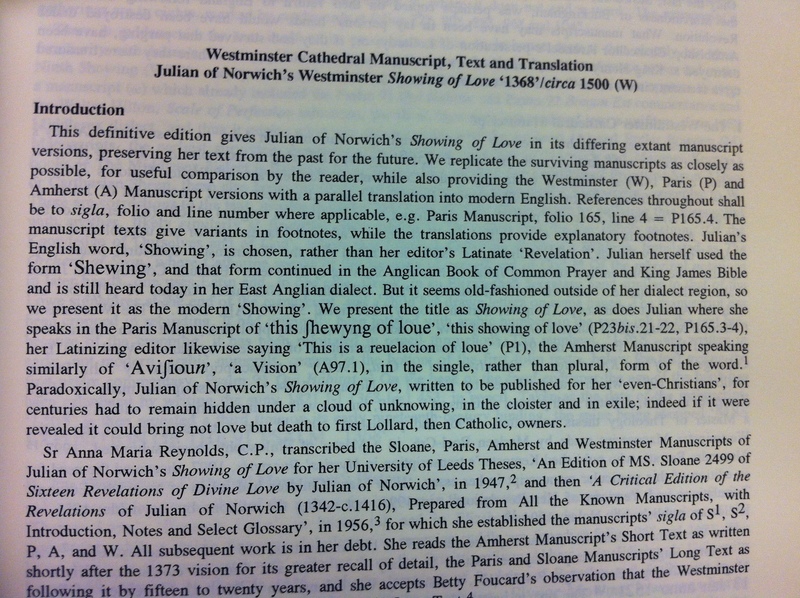 The Slone and Paris Manuscripts contain the Long Text of Julian of Norwich’s Showing of Love. Within this form of the text she explains that her deathbed vision took place in May of 1373, and that she then contemplated upon it for from fifteen (1388) [per the Slone] to twenty years (1393) [per the Paris], performing this book of her Showing of Love, finishing the final version when she was fifty. [And this all came before she took out her translations after 1416.] These manuscripts contain all of the Westminster version of her text, boilerplating onto its theology the series of visions as narrative frame that she had when she and those with her thought she was dying. She was inclined to doubt the validity of these visions…. Julian thus begins writing the Long Text while Adam Easton is still a prisoner of his Pope. She completes it when Cardinal Adam Easton is finally able to return to Norwich…. By 1413 Julian’s situation had changed. Cardinal Adam Easton had died in 1397. Archbishop Chancellor Arundel, for political more than for religious reasons, was forbidding upon pain of death so much of what was contained in the earlier Showing of Love, the Bible and theology in the vernacular, teaching by a woman, the concentrating on the crucified Christ rather than upon wooden painted crosses…. Julian at seventy, with the help of a Carmelite scribe, … revises her Showing of Love, and it appears in abbreviated form in a manuscript forming a gathering of contemplative texts…. This Amherst Short Text version lacks “Jesus as Mother,” the Parable of the Lord and the Servant, and much of the material translating the Bible. Yet it crystallizes Julian’s mature thought and exempifies her courage, for by using the Lollard term “even-Christians” Julian courted burning by Arundel. She ends this text so, bravely adding “Amen,” knowing its Hebrew meaning, as affirming what is said, what is spoken, what is done, what is created [and what was, at one time from the Hebrew Bible, translated]…. 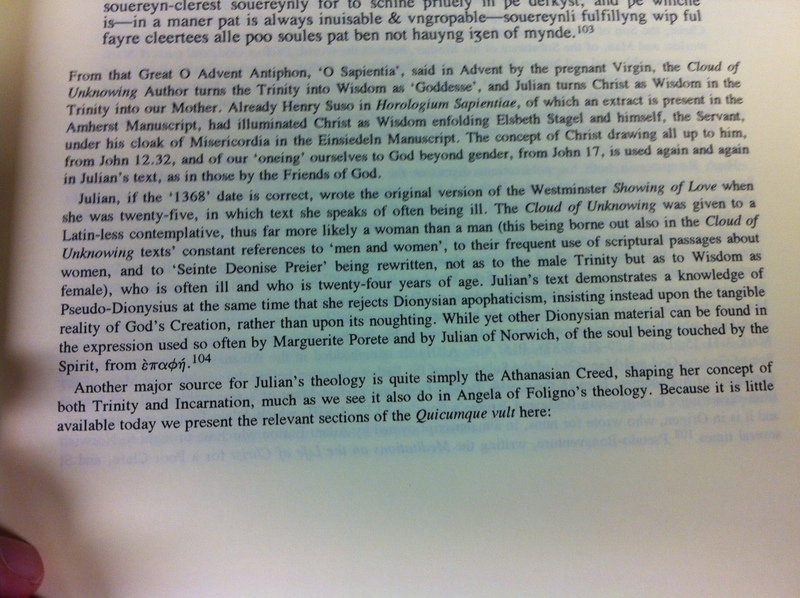 So, I’d like to add a few things about Holloway’s translating of Julian’s translating. 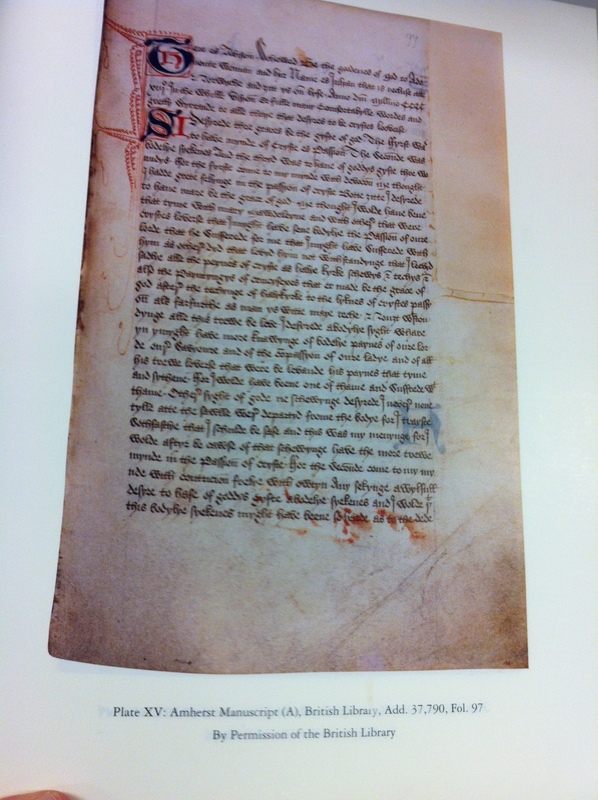 I’d like to show a bit more of what she’s done with her composite translation of Julian’s manuscripts. 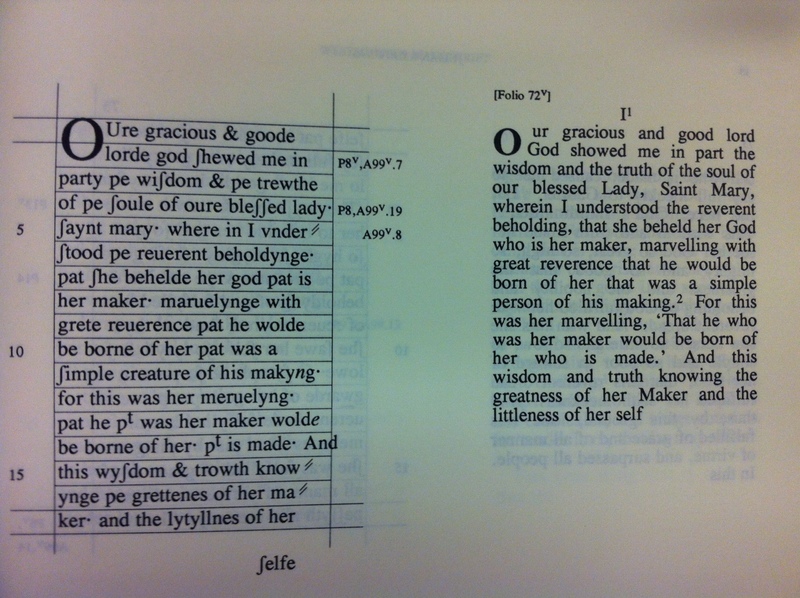 There will, however, always be a place for translations for readers who cannot read Middle English. For those willing to attempt Julian’s texts in their original forms, there is now a huge choice of editions with varying editorial philosophies and extensive glosses, annotations, and/or glossaries. We could still use affordable editions with facing-page prose translations into Modern English that are not afraid to diverge quite markedly from the Middle English in order to render the linguistic nuances of the original. 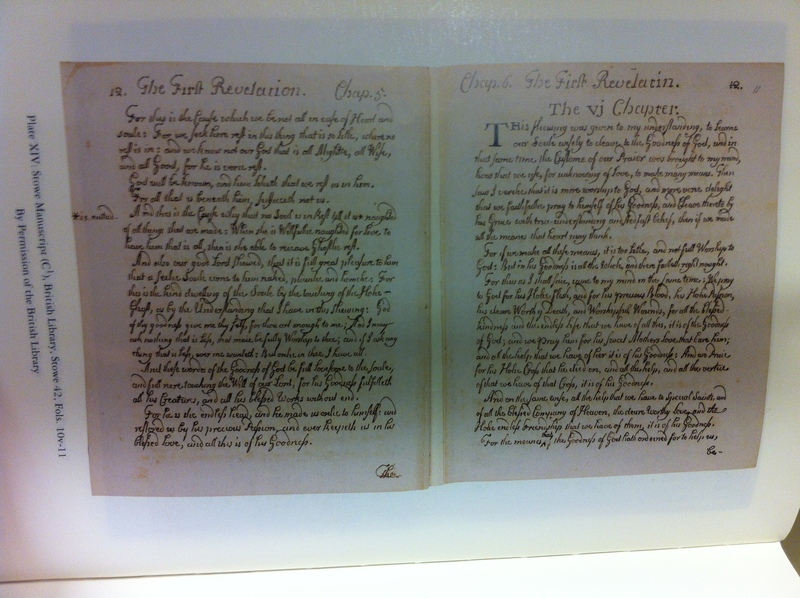 (Reynolds and Holloway provide modernizations, rather than translations, on the same page as “quasi-facsimile” editions of Westminster, Paris, and Amherst. [Nicholas] Watson and [Jacqueline ] Jenkins consider, and reject, the provision of translations as such, instead preferring extensive notes and paraphrase.) Such versions hardly sound like potential bestsellers, and indeed both Reynolds and Holloway’s monumental edition and Watson and Jenkin’s are expensive (190 Euros and $72 respectively), putting them beyond the reach of students or even of most general readers.